Comment: “The Lord…has sent me to bring good news to the oppressed, to bind up the brokenhearted…” This text from Isaiah speaks words of hope and good news for those who have little. At Advent this should be our focus as well, living in a way that expresses God’s justice and righteousness for the oppressed, brokenhearted, captives, prisoners, and those who mourn. A vision of hope for a people in the midst of sorrow is clearly expressed in Boxes for Katje. Katje and her fellow townspeople have little following the end of World War II. In their Dutch town they go without soap, milk, sugar, or new clothing and shoes. When Katje receives a box from America, we see a beginning glimpse of comfort in the form of a chocolate bar, which she shares with her mother and the postman. Katje becomes pen pals with the girl who sent the box and over the year receives boxes with many more items of food and clothing to share with the people in her town. It is not just the receiving of much-needed items, but also the building of a relationship with faraway friends that brings comfort, joy, and hope to Katje, her family, and friends. They express their joy in a box of tulip bulbs, which they send to their new friends in America. Comment: “…hold fast to what is good…the one who calls you is faithful…” In this epistle, Paul is encouraging the Thessalonians in faithful living as they wait for the return of Christ. The strength of this passage is rooted in the faithfulness of Christ. Because of his faith, we can live faithfully and expectantly with our lives turned toward him. Welcome Back Sun expresses what it is to hold fast in the midst of the not yet. We read the story of a family that lives in the darkness for months, eagerly awaiting the return of the sun. Their tradition holds stories of the sun’s faithful return being witnessed by a girl who ran up the mountain to find it. 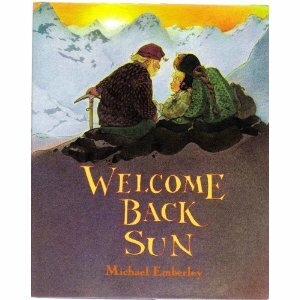 The young narrator asks her parents again and again if they can climb the mountain to greet the sun. Eventually her parents agree, and when the time comes, they travel up the mountain with countless others to experience the great light breaking through the sky. Like the girl, may we hold fast to the hope of what is to come, with our faces turned expectantly towards the faithful light. Comment: “There was a man sent from God whose name was John. He came as a witness to testify to the light…” The focus of this text is on John’s identity as witness to and testifier of the coming light of the world, Jesus. His work is to tell the people of the one who is coming. Paper Boats is a simple story of a boy who wishes to be known. He folds paper boats and floats them down the river. The boats carry the name of the boy and the village where he lives. The boats’ purpose is to share his identity throughout strange lands, so that the boy may become known to others. In this way, they become witnesses. Lectionary Links: Sunday, December 11, 2011 by Storypath is licensed under a Creative Commons Attribution-NonCommercial 4.0 International License.